This is not a hike that I would normally write up. But it requires attention on two counts. First, it's a impressive waterfall, by Southern California standards. Second, it has a short paragraph in John Robinson's immensely popular Trail of the Angeles, and needs a more thorough treatment. Robinson ends his 67-word blurb by saying, "In times of high water, these are the most spectacular falls in the range." And after visiting these falls, I can certainly see how he can make such a statement. Glen Canyon Falls (sometimes spelled "Glenn") consists of three separate waterfalls in close proximity. I estimate that the total height may be upwards to 130 feet. 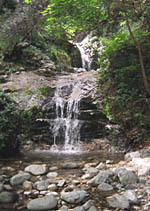 The upper two falls have a wide flow, in contrast to the typical waterfall in the San Gabriels in which the water courses through a narrow notch. Unfortunately, the upper falls are not safely accessible without technical equipment and skills. And to get a glimpse of them requires a scary scramble up a precariously steep, loose slope. Getting to the lower falls requires a quarter mile of boulder hopping and negotiating some dicey sections, which may result in wet feet. You'll also have to dodge poison oak, which is abundant in the canyon. And then there is the distance. Unless you are into walking 13 miles round trip on a paved road, plan to do it as a bike hike. It's a very pleasant ride. 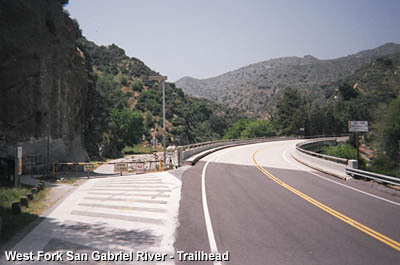 The paved road is locked to general public vehicular traffic but is used by various agencies, such as the county to service Cogswell Dam and the Forest Service to maintain the trail camp. And driving access is granted to those who are handicapped. This hike can be done all year long, however if you intend to view water in the falls in their strength, you will want to hike in the winter or spring after some good rains. In the spring the wildflowers and lush green flora is delightful. From Interstate 210 in Azusa, take Azusa Avenue (Hwy 39) north about 12 miles to the junction at the East Fork Road (8.6 miles from the forest station at the mouth of the canyon). Continue up Hwy 39 past the the OHV area, the Rincon Educational Center and Ranger stantion, and in one more mile arrive at the West Fork bridge. There are some parking places on the left before you cross the bridge, or you can cross the bridge to the large parking area. (Note that on fair-weather weekends the parking can be quite full, and on a holiday weekend such as Labor Day or Memorial Day, you may not find a parking place within a quarter mile of the trailhead.) A National Forest Adventure Pass is required. From the locked vehicle gate at the south end of the bridge on Hwy 39, proceed west by the gate on the paved road. The scenic path follows along the West Fork San Gabriel River. This is beautiful country. The river dances and splashes under an umbrella of alder, spruce, oak, and big-leaf maple. 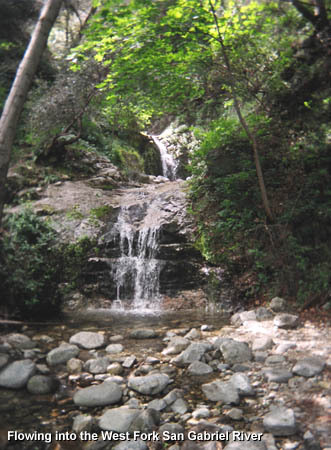 At one mile your pass the trail junction for the Bear Creek Trail, which heads north into the San Gabriel Wilderness. There are yellow mile makers along the way giving you an accurate assessment of your progress. Un-named falls - This set of four falls flows into the West Fork from the south View Large Photo. At 2.9 miles you find a delightful set of four un-named waterfalls on the left (south). I estimate the lower falls at 12 to 15 feet high and the second falls at 15 to 18 feet high. It's an easy scramble to the base of the second  but watch your step: the wet rocks can be slippery and send you into the water. From the right bank near the base of the second falls you can look up stream to get a look at the upper two falls, which appear to be about the same size as the lower two. I did not proceed past the base of the second falls, but it looked like others had followed a tricky route going past the second falls on the left bank. In another 0.2 mile up the road you pass some weeping walls on the left, seeping water from the massive rock faces. During the rainy season, the water flowing over these cliffs can be quite showy. In the spring the route offers a variety of blooming wildflowers in a rainbow of colors. At 6.3 miles you reach Glenn Trail Camp. If you have biked to this point, find a place to secure your wheeled steed. Walk the path that heads left (south) past a campsite and into Glen Canyon. After a couple minutes the trail disappears into the streambed where a four-foot high dam impedes your progress. The dense poison oak on the steep right bank rules out that route. If you don't mind getting wet, you can climb over the top of the dam and wade through the three-foot deep pool. Or you can try bypassing the dam by climbing the rock outcropping on the right. I choose that route and grasped what looked to be a sturdy rock handhold to pull myself up on the edge where the dam meets the rock. To my horror, a 50-pound chunk of the rock my hand was gripping broke away and followed me into the water. Thankful I was merely drenched and not injured. So at that point I wadded past the dam. 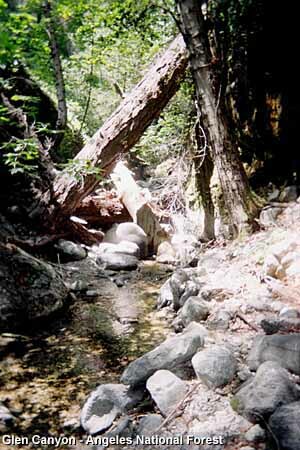 You continue up the creek, hopping rocks, navigating obstacles, and avoiding the abundant poison oak. After about a quarter mile from the road, you reach the base of the lower fall. Water gushes through a narrow slot and falls about 30 feet into a deep, green pool. The upper two falls are out of view from here. Robinson states, "To see all three at once, climb about 30 feet up the west slope opposite the lower fall." I would add "...if you have a crazy streak with a bent toward risky adventure." Climbing that route is dicey and presents some risk. I really don't want to accept responsibility for sending anyone that way. But I tried it. First I climbed up the tributary that comes in from right (west). After about 30 feet I reached a large log that blocked my path. At this point I still could not see past the lower fall. I climbed over the log and proceeded up with no view. So I decided to climb the steep bank on the right (south). The dirt was loose and I had to navigate around poison oak, all the while wondering about my sanity. After about 20 feet of precarious climbing, I finally got a glimpse of the upper two falls. They are impressive indeed, but my view was greatly impaired by the dense trees. I determined that climbing higher would not provide a better vantage. I carefully climbed down to the tributary bottom and got back to the fore-mentioned log. I won't admit to a balancing act along the log and risking a 25-foot vertical fall to rocks below while negotiating a narrow ledge, climbing over and around some rocks and tree roots, and reaching the area above the lower fall. And I won't admit that I discovered that even though the view from here toward the upper two falls is pretty good, the route from here to the base of the second fall was too dangerous even for a crazy guy. Bottom line, I don't think the reward of going past the lower falls is worth the danger and risk, unless of course, you have technical canyoneering skills and equipment. These three waterfalls would be great candidates for a series of stairs and catwalks if they weren't so far from the main highway. Glen or Glenn? 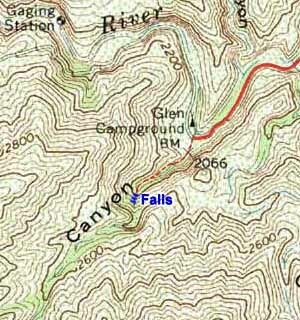 : The USGS topo map uses the spellings Glen Canyon and Glen Campground. The Thomas Harrison map uses Glen Canyon and Glenn camp. John Robinson uses Glenn Canyon and Glenn Trail Camp. The Forest Service follows the USGS topo for the canyon, Glen, and uses Glenn for the camp. Perhaps "Glenn Canyon" spelling would distinguish the canyon in the San Gabriels from the well-known Glen Canyon on the Colorado River in Arizona. SGM: The Waterfalls - by Tom Chester, Jane Strong and Paul Ayers. Includes the falls on their list and puts its location (in decimal degrees) at east longitude: 242.0454; north latitude:	34.2380, with the elevation at 2309'. Glenn Trail Camp - Official information from the Angel National Forest website (makes no mention of the falls). Trails of the Angeles: 100 Hikes in the San Gabriels - by John Robinson with Doug Christiansen (Wilderness Press, 8th Edition, April 2005). Hike 71: "West Fork of the San Gabriel River, Highway 39 to Glenn Trail Camp, Cogswell Dam and Reservoir." 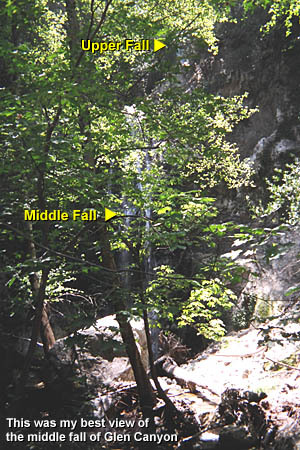 They include one short paragraph about Glen Canyon Falls: "A short cross-country side trip can be made to the Falls of Glenn Canyon, 0.25 mile up from Glenn Trail Camp. 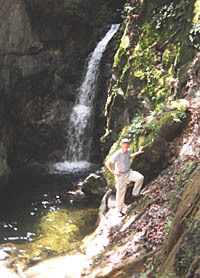 They are three cascades, one right above the other, in the densely wooded canyon. To see all three at once, climb about 30 feet up the west slope opposite the lower fall. In times of high water, these are the most spectacular falls in the range." Afoot and Afield in Los Angeles County - by Jerry Schad (Wilderness Press: Berkley, 2nd Edition, Sept. 2000) - Area A-10, Trip 3: "Lower Devils Canyon. Describes a bike ride to Cogswell Dam and hike up Lower Devels Canyon. Makes no mention of Glen Canyon Falls. This page was last updated June 30, 2006.